SHOEMAGIC SOLE is an unique system developed for the Footwear Industry customer needs. Export High Quality 3D/2D graded cad result ( Iges, Step , Rhino 3DM ,STL,Dxf….) Sidewall thickness, geometric shapes keeping , common components sharing , Customize request functions for Sole application request. SHOEMAGIC is a special application for shoe industry full size grading. 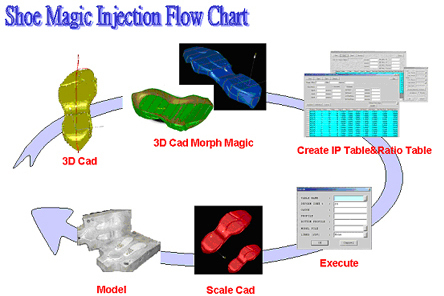 Accept IGES file from any CAD/CAM system or Scanning data from scanner. The calculation include every parts. ex: out sole , mid sole, shank, bag …, and even characteristic lines for drawing, parting surface for machining. If all specification has defined in 2D drawings. 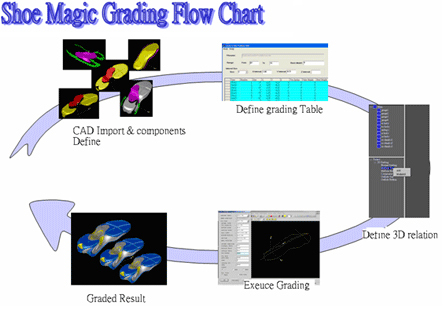 "Shoe-Magic" can find grading points for each component part from two different drawing. Define some components in several size (shank,bag….) . SHOEMAGIC can define different expansion ratio in different blocks. The different scale ratio include "Spine ares:X,Y,Z" and "Side wall:thickness / height"
SHEOMAGIC automatically caculate to scale down model.